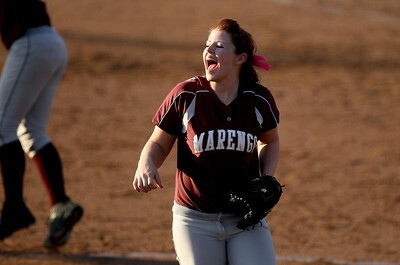 Sarah Nader - snader@shawmedia.com Marengo's Lindsay Melson (left) celebrates a run during Tuesday's season opener against Elmwood Park at Judson University on March 13, 2012. Marengo won, 3-1. 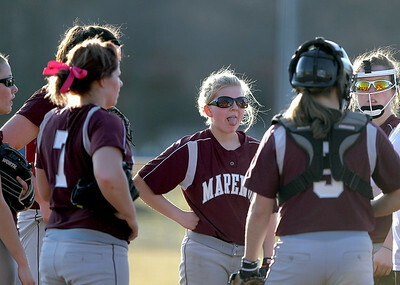 Sarah Nader - snader@shawmedia.com Marengo's Larissa Pfeiffer (center) and the rest of the softball team talk during a time out during Tuesday's season opener at Judson University on March 13, 2012. Marengo won, 3-1. 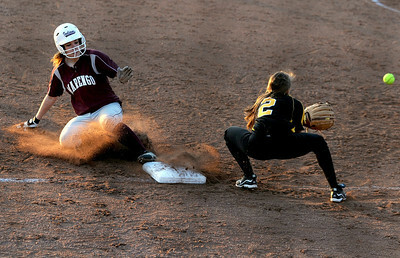 Sarah Nader - snader@shawmedia.com Elmwood Park's Catherine Conte (left) is safe at third while Marengo's Stephanie Carwright tries to tag her out during Tuesday's season opener at Judson University on March 13, 2012. Marengo won, 3-1. Sarah Nader - snader@shawmedia.com A Marengo softball player watches the game during Tuesday's season opener against Elmwood Park at Judson University on March 13, 2012. Marengo won, 3-1. 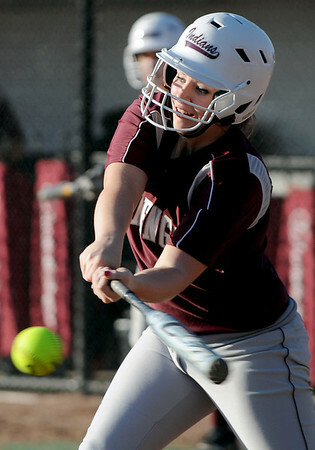 Sarah Nader - snader@shawmedia.com Marengo's Stephanie Cartwright takes a swing at the ball during Tuesday's season opener against Elmwood Park at Judson University on March 13, 2012. Marengo won, 3-1. 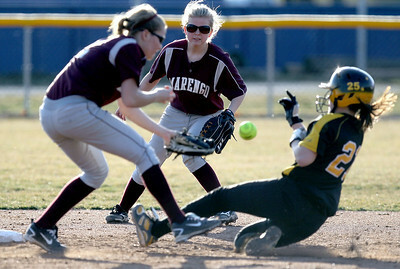 Sarah Nader - snader@shawmedia.com Marengo's Larissa Pfeiffer (center) watches as Marengo's short stop Shae Karsten tries to tag out Elmwood Park's Arianna Kelley at second base during Tuesday's season opener at Judson University on March 13, 2012. Marengo won, 3-1. 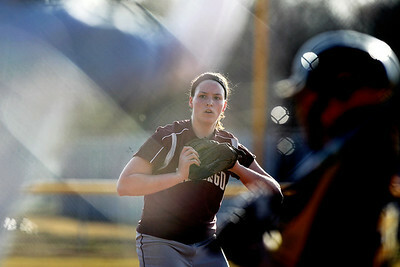 Sarah Nader - snader@shawmedia.com Marengo's Lindsay Melson pitched during Tuesday's season opener against Elmwood Park at Judson University on March 13, 2012. Marengo won, 3-1. Sarah Nader - snader@shawmedia.com Marengo's Megan Semro (left) slides safely into third after Elmwood Park's Olga Lipiszko misses the catch during Tuesday's season opener at Judson University on March 13, 2012. Marengo won, 3-1. 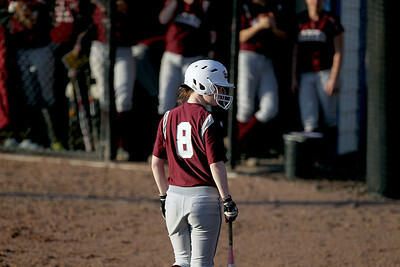 Sarah Nader - snader@shawmedia.com Marengo's Ashley Borhart gets ready to bat during Tuesday's season opener against Elmwood Park at Judson University on March 13, 2012. Marengo won, 3-1. Sarah Nader - snader@shawmedia.com Marengo's Stephanie Carwright celebrates and out during Tuesday's season opener at Judson University on March 13, 2012. Marengo won, 3-1. 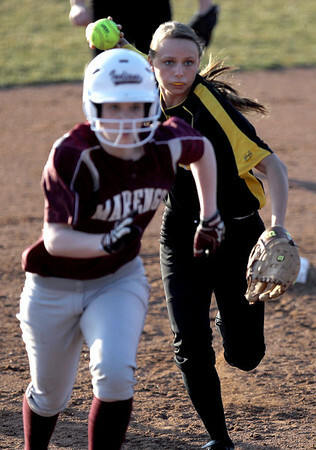 Sarah Nader - snader@shawmedia.com Elmwood Park's Olga Lipiszko chases after Marengo's Ashley Borhart while she runs to third during Tuesday's season opener against Elmwood Park at Judson University on March 13, 2012. Marengo won, 3-1. 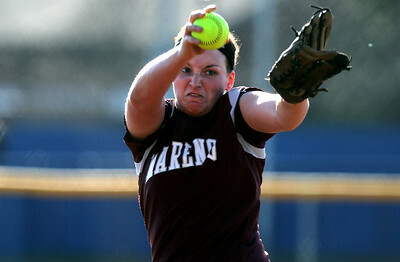 Marengo's Lindsay Melson pitched during Tuesday's season opener against Elmwood Park at Judson University on March 13, 2012. 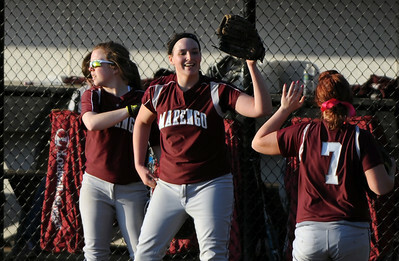 Marengo won, 3-1.